There is a magical place where wall murals, pop songs and vintage arcade games never die. Disco balls spin, mom is allowed to wear her sequined beret, and kids can order a soda that includes every flavor of the fountain, called a “graveyard,” or spend a quarter on a gobstopper the size of Barbie’s head. Yes, it’s your local roller rink. For active family fun, the local rink is nothing short of miraculous — especially if you are dealing with high-energy kids, or entertaining a gaggle of surly tweens. Where else can you burn calories, build balance and lift everyone’s spirits? At the rink, dad can sing along with Katy Perry and show off “shooting the duck” and nobody dies of embarrassment. Like riding a bike, roller skating is a coordination-building exercise: The more you skate, the better you roll. Very few beginners instantly take to skates and blaze laps like Olympian speed skater Apolo Ohno (who began his speed skating career on quads at age 6! ), so remind kids that, like riding a two-wheeler, roller-skating takes practice. The key is exposure. “Give them every opportunity to be on skates,” says Sara Girard, a former roller derby queen (IRockit of the Throttle Rockets) and mother of two young skaters. 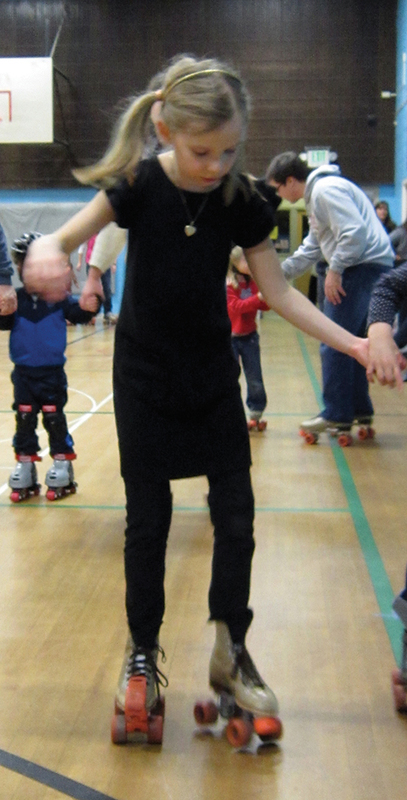 When to start: The prevailing wisdom is that if you can walk like a duck (around ages 3–5), you can learn to skate. Many rinks have a beginner’s class before family skate on weekends, and some have a tot skate for little ones and caregivers during the week. 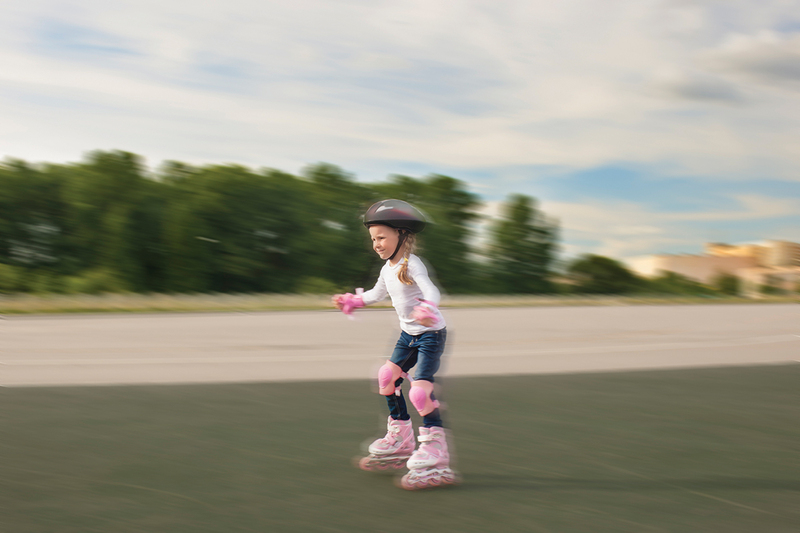 Quads versus in-lines: Traditional roller skates, or quads, have four wheels and a toe break, and for many people offer more stability than in-lines, the most well-known brand being Rollerblade. (Quad wheels can be tightened on tiny tot skates so that they don’t turn as quickly — ask staff for assistance.) In-lines are lighter, offer more rigid foot and ankle support than quads, and have a heel break. In-lines also are typically more expensive than quads to rent. Sizing skates: Both quad and in-line skates should fit snugly. You can’t skate well if your foot is sliding around inside the boot. Rental skates are only available in whole sizes, so size down if you need to. Lace quads up tight and stow lace ends inside the boot. Safety gear: Bring your own helmets, kneepads and wrist guards. Helmets and kneepads may be overkill for social skating, but wrist guards are wise, especially for parents whose livelihoods depend on deft mouse and keyboard skills. Learning to glide: All of the Seattle area’s local rinks have classes, and some offer private instruction— but here’s a quick tip: focus on the glide. The basic motion of the glide is to slide your right foot forward at an angle, shift your balance, and repeat with the left foot. Mastering the smooth right-left-right-left rhythm is more important than speed. Skating well depends on finding your center of gravity. Often when you are feeling shaky on your wheels, all you really need to do is tuck your tummy and steady yourself from your core. Skating well socially means being aware of everyone around you. When you fall, “fall small”: Don’t bring others down, and get up quickly. Sooner or later, everyone falls. Freak accidents do occur, but most of the time you can pick yourself up and skate on like it never happened. It’s good practice for dealing with life’s small failures. When my kids started skating, we often went to the family skate on Friday nights at the Bitter Lake Community Center Annex in North Seattle. Most of the action is in the big gym, but there is a smaller room open just for beginners, where we got over our nervousness. For my family, having a small, judgment-free environment to learn to fall was almost more important than learning to skate with the pack. For some kids, smaller rinks, such as Bitter Lake's weekly session, Everett’s Skate Deck and Southgate Roller Rink, might be good places to learn, while more proficient skaters may prefer the super-smooth wheel-feel of larger rinks offer similar amenities — from disco lights to arcade games to gumball machines — each is unique, so try out a few before you settle on a favorite. Like Xanadu, many of these magical places have limited hours; so be sure check the schedule. Also, several local rinks (such as Skate Tiffany's and Lynnwood Skate) offer free passes for kids through the Kids Skate Free program. This is the best skating deal in town. On Friday nights, starting at 6:30 p.m. the Bitter Lake Community Center Annex in northwest Seattle turns into an awesome, super family-friendly roller rink, with no video games in sight (but plenty of fun games run by the M.C.). And just $4 gets you rentals and skate time. Lessons are available before skating begins. Important note: Bitter Lake Community Center Annex is not next to the Bitter Lake Community Center; it's behind Broadview Thompson K-8. Follow the address. The original home to Rat City Rollergirls, this White Center rink has serious rink cred, a full bevy of snacks and refreshments, and is close to other White Center hot spots such as Full Tilt Ice Cream. Specials include family skate sessions ($8 admission, includes quads). Also find school holiday special sessions and birthday party packages. The Skate Deck is another classic, and you can find “walkers,” stability aids for beginner skaters — ask staff for assistance. Specials include Wednesday family skate evenings for $5. Birthday party packages are available. You can bowl and you can skate at this Lynnwood rink, which also offers video games and refreshments. Specials include all-ages skate sessions for $9.50 and Saturday "learn to skate" sessions for $15. Also find birthday party packages. Skate for just $6.50 on a Thursday family night session. It also offers a tiny tot skate, school holiday special sessions and birthday party packages. The Auburn Skate cheap skate session is $4.50. Other kid amenities include birthday party packages plus late-evening Teen Skate sessions for $7. The Friday Night Lights evening skate for $10 is great for teens. 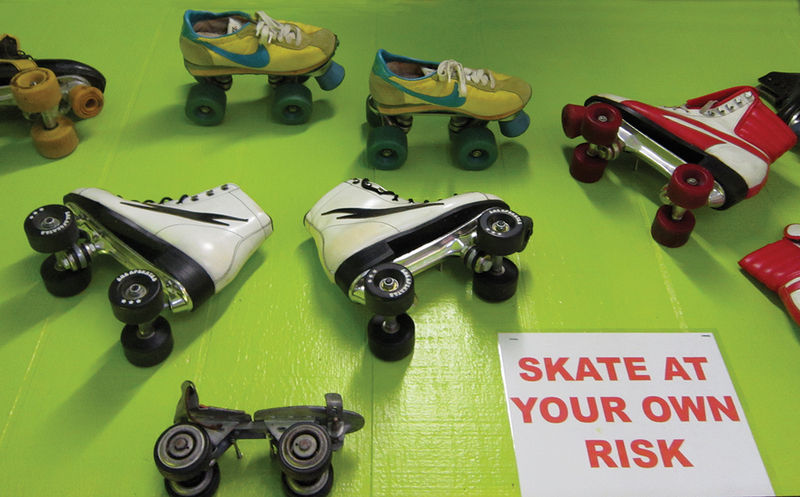 They've also got a cheap skate for $5, 'lil Skaters ($5) and birthday party packages. Specials include $6 admission that includes skate rentals. During regular skating sessions, groups of 15 or more save $1 per person. Also find birthday parties, glow parties and more! 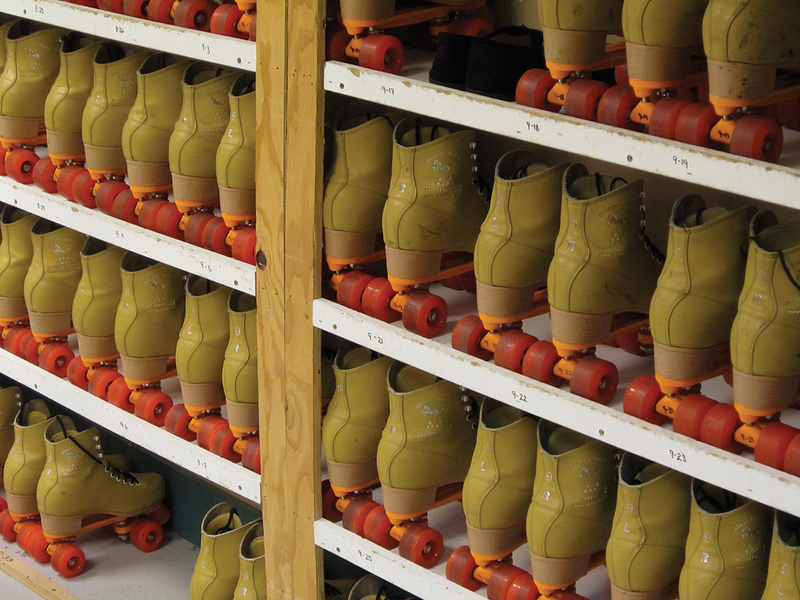 This Puyallup roller hot spot participated in the Kids Skate Free program, which offers free passes to kids (go to the Kids Skate Free website to find out more), and $2 Tuesday skate sessions (from 4-8 p.m.) are an especially good deal. It also has an arcade, and many other special sessions; check their Facebook page for more. Check out the after-school skate for $4 and family night for $5, as well as school holiday special sessions and birthday party packages. Skate-friendly parks and paths abound in the Seattle area. Rat City Rollergirls founder and veteran trail skater Jennifer Warnick recommends wearing safety gear while trail skating, and — if skating with quads — getting outdoor wheels. Enjoy views of downtown Seattle, the Duwamish and the Olympics while skating the paths around the playground and at the skate dot (a small skate park). Along with many nice, flat stretches of pavement for beginners to test their wheels, there are also gentle slopes for those who yearn for speed. This lid park has stunning views of the city, the Cascades and, when it’s out, Mount Rainier. The outer loop on the upper park is about a half-mile around and makes a reasonable lap; also, there is a circular paved path at the renovated playground (in the park just south of the reservoir park) that is great for beginner skaters. You will find many quiet places to skate in this former naval base, but you can really get your boogie on via the beach walk, the paved path that extends from Magnuson’s boat launch to the northwest gate of the off-leash dog beach. This historic Tacoma park has changed a lot since 1901. Recent upgrades favor skaters with smooth sidewalks around the skate plaza and two playgrounds. Skating at the beach! On a sunny day, walkers, cyclists and skaters throng to this paved trail — so depending on skating ability, you may want to wait for clouds and lighter traffic. For an extensive list of in-line skating trails in Washington, see the Rails-to-Trails Conservancy website. Your kid may be content just holding hands with her best friend and skating in an endless loop. (Awesome!) 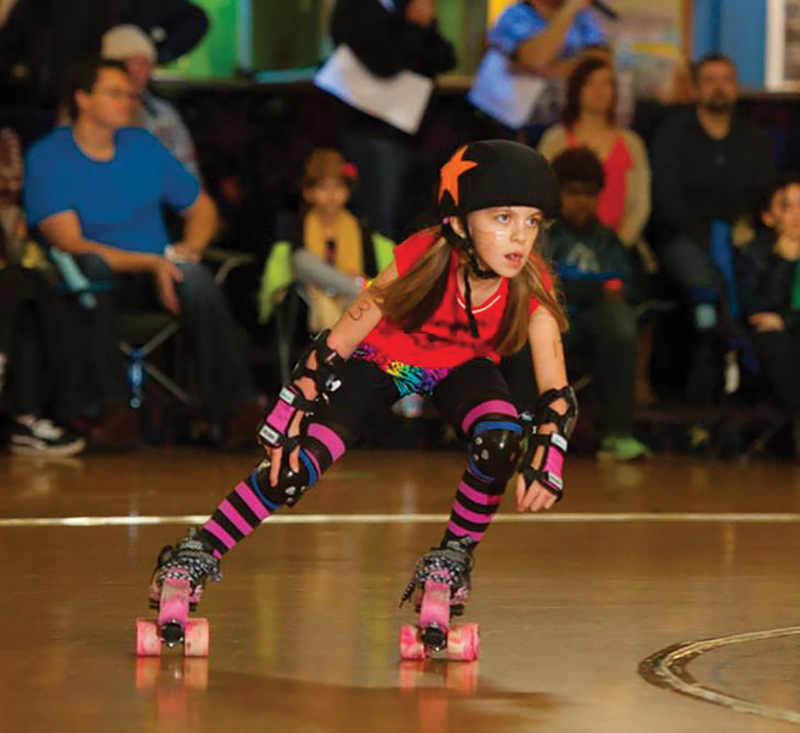 But if she lives to whip around the rink, she could grow up to be a jammer for one of our local derby teams — a shout-out to the Rat City Rollergirls (Seattle), Dockyard Derby Dames (Tacoma), Oly Rollers (Olympia) and Jet City Rollergirls (Snohomish County)! Many junior derby teams take kids of ages in the single digits, including Seattle Derby Brats and Everett’s Mob City Misfits. Roller derby’s gender bias does skew toward the female, but as derby rises in popularity, there are more opportunities on the flat track for boys. 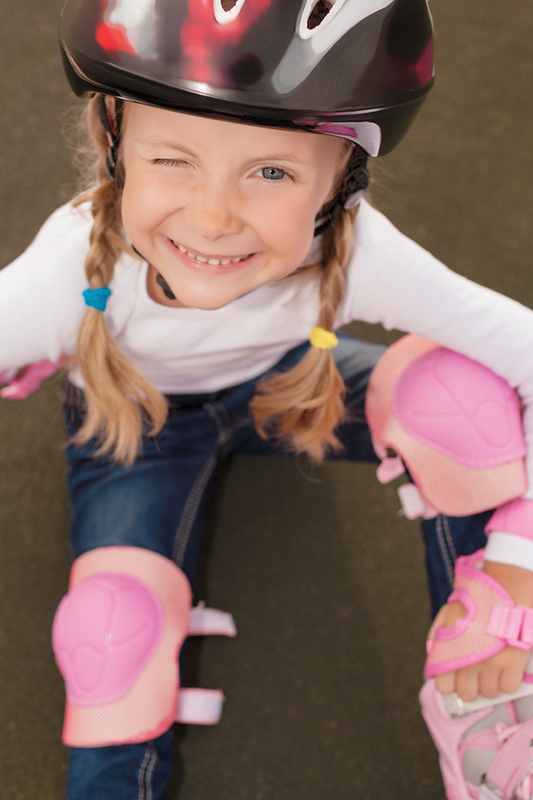 Parents, be forewarned — roller derby is a full-contact, competitive sport that requires an array of body armor and protective gear. Bodily injury is not the only concern: There is serious competition, so expect some emotional bruising if your kid doesn’t make the cut. Note: This article was originally published in 2014, and updated for 2017. Annie Fanning is a mother of two brilliant daughters, a Seattle Tree Ambassador and a flower-throwing anarchist.